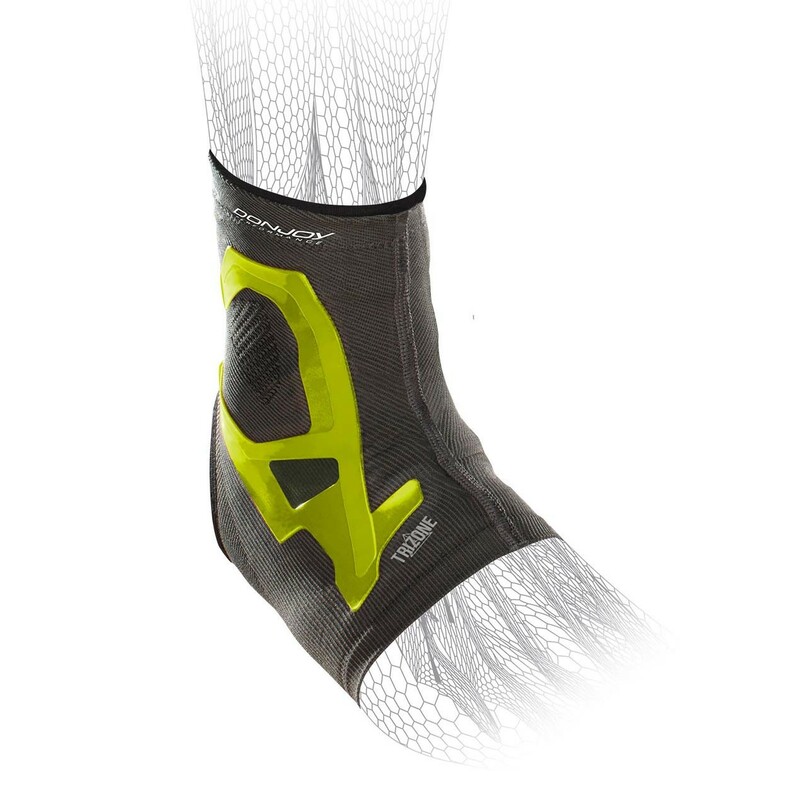 Our DonJoy Performance Trizone Ankle Sleeve is a hybrid design combining the properties of compression and bracing in a single sleeve. The carbonized bamboo circular knit construction allows for targeted, zonal compression with thermal regulating properties. 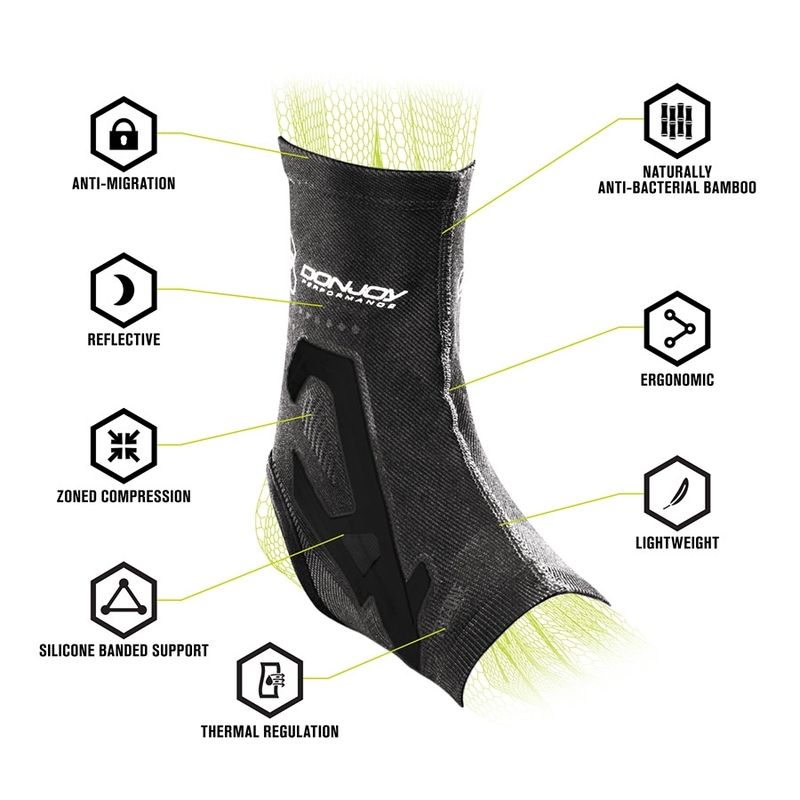 Three distinct compression zones which include: a stability zone with strategically placed injected silicone to provide support for the ankle and the benefit of enhanced proprioception, a compression zone which improves circulation and provides mild support to the joint structure and surrounding muscle tissue, and a comfort zone that provides lighter compression for enhanced fit and better range of motion. 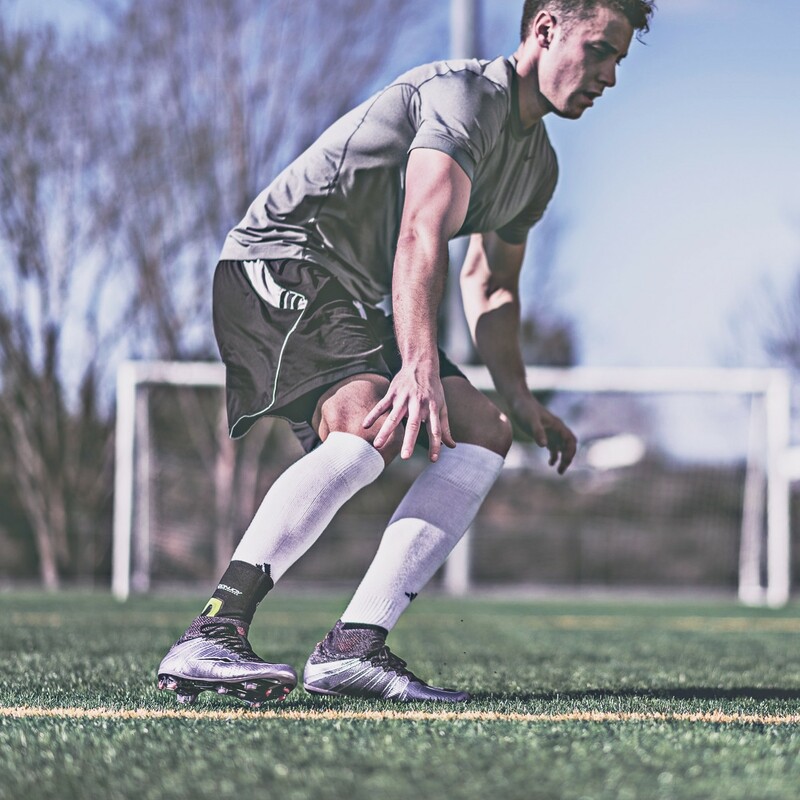 The Trizone ankle support is a low profile performance product designed to increase ankle stability, plantar fascia support, and decrease swelling and inflammation while fitting comfortably in any shoe without compromising fit and function. I have some soft tissue damage under the arch as well as a tendon issue in my ankle from falling in heels. I have already done the cam-boot for more than 8 weeks but still have pain, will this brace help to keep things stable until its fully healed? 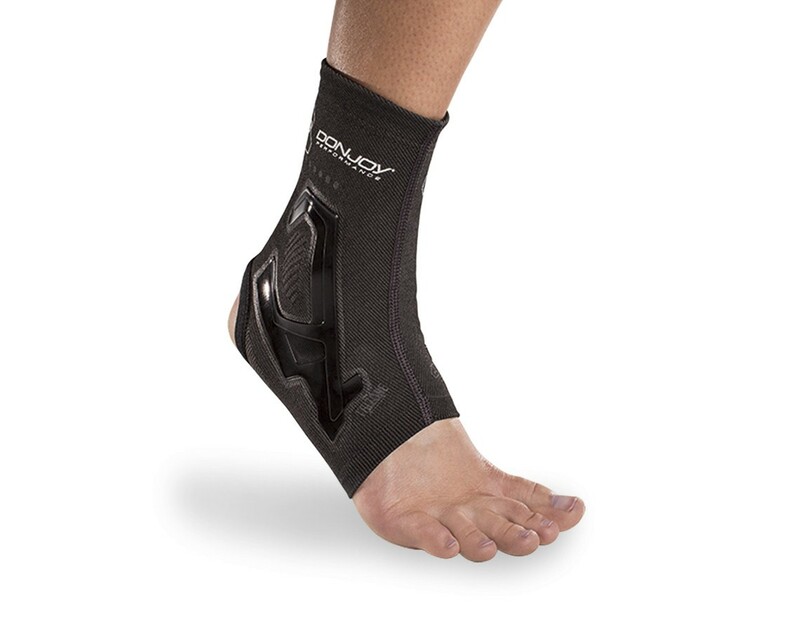 This brace provides a low level of support, and compression to help with swelling. You may want to consult with your physician regarding where you are in the heeling process if this would be appropriate or if you need something with more rigid stays on each side. Does this product help in running and basketball activities with a previous achilles tendon injury? I have drop foot from nerve damage. Would this brace help pull my foot up for walking without shoes on? No, this is an ankle brace. It will not help pull your foot up for walking. You can look at the ProCare Super Lite AFO. This is specifically for drop foot. If you have a accessory navicular,will this help stop the pain put on the tendon? 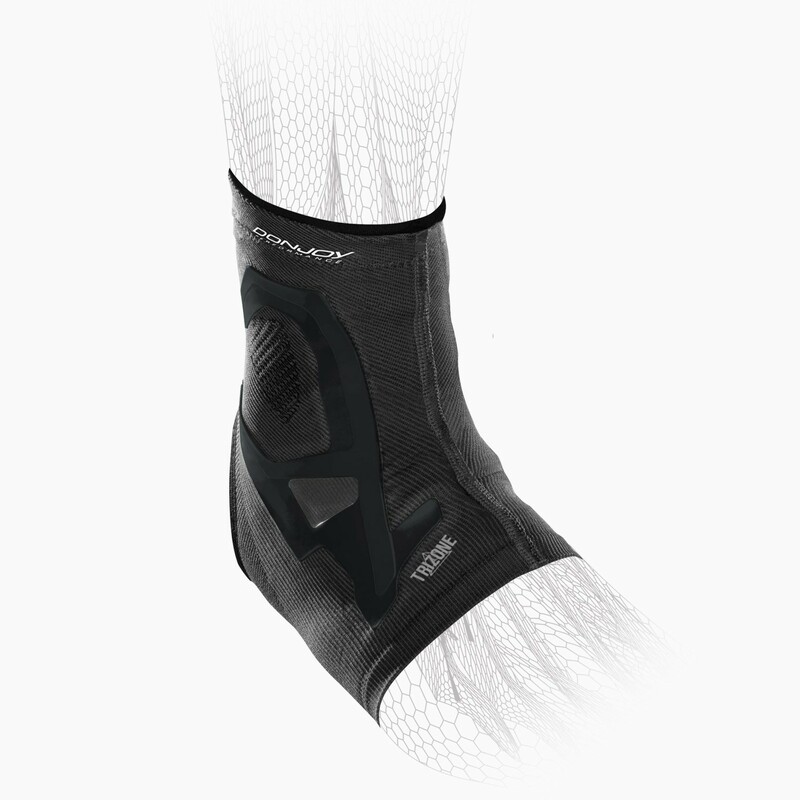 The Trizone Ankle Support, would help with pain, but if you need more support for pronation, the Aircast A60, https://www.betterbraces.com/aircast-a60-ankle-support-2, would be a better option. The Trizone Ankle Support would be a very good brace for Peroneal Tendonitis, as it similar to taping to stabilize the foot and ankle during gait. Can I wear this while surfing for support? How would you recommend to clean/wash after? 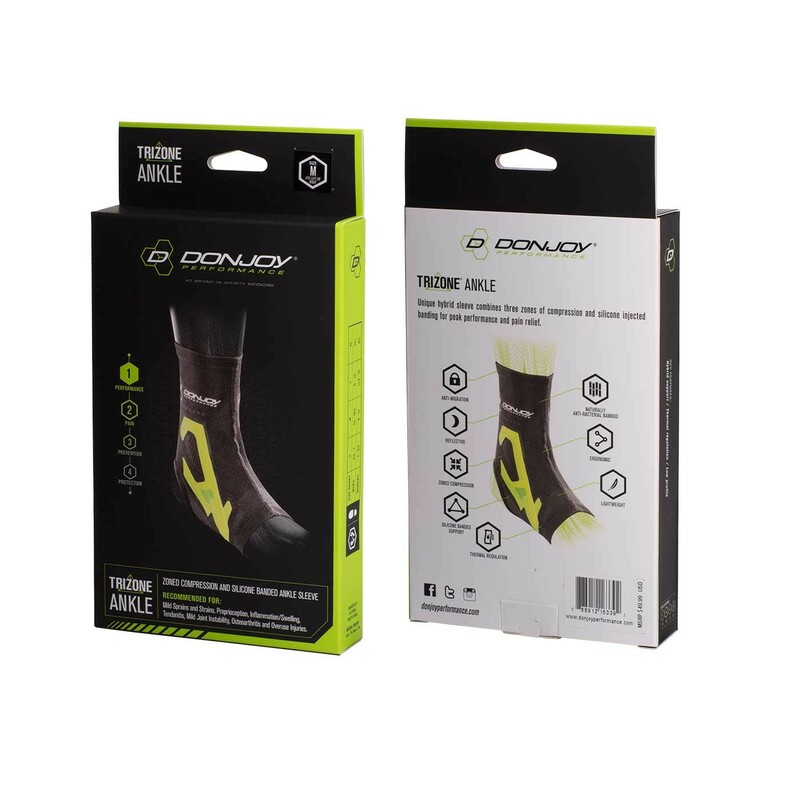 The TriZone Ankle Support, as well as any of the other Donjoy Performance products, are designed for use in water. Please make sure to hand wash thoroughly after use and air dry. Hi, I'm a runner and I'm concerned about the thickness of the sleeve, is it as thin as it looks? Also should it be worn under or over socks? Thanks. This sleeve is pretty thin. It fits your foot snug to offer you compression. It should be worn under your socks to give you compression. I recently suffered a break of the ankle and also a tare of the deltoid lig. I am looking for something to offer compression as I work back through physical therapy. I currently have a donjoy tie ankle brace but I am looking for something that is slightly slimmer to fit into shoes so I can work back into walking/running without much support. My son wears a size 8 mens soccer boot with a wide foot. He rolled his ankle causing a mild sprain. Would this be a good product for mild sprain? Also, what size would you recommend for him with this product? I have problems with edema in my feet and ankles and have had compression sleeves in the past that end up being painful because of the swelling. Would you recommend going up a size? Recently sprained my ankle while running on a trail. Would this be for street running and for running long distance ? What is the best method for cleaning and drying? I had a Class lll sprain with ligament damage not tear. I would like to start running again. What product would be best for my ankle? For a class 3 sprain, I would recommend the Don Joy Stabilizing Pro Ankle Support or Aircast Airsport. Does this product come in pair. It is only one product. how will your brace help my plantar fasciitis? Does it take the place of a boot? 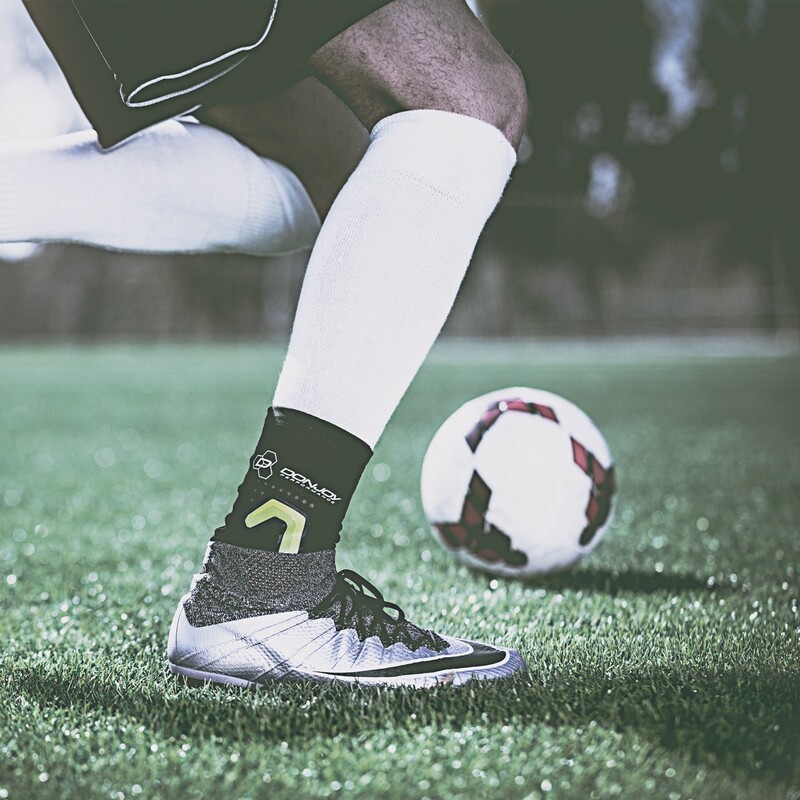 The TriZone Ankle Support helps provide relief to the plantar fascia by applying compression as well as providing low profile support and stability to the ankle from the silicone banding on the medial and lateral sides of the brace. What is this sleeve made of? Is it nylon or polyester? The Trizone Ankle Support is comprised of an alll-natural Carbonized Bamboo material that is thermal regulating and anti-bacterial helping to eliminate odors. These ankle supports have been a godsend! After retiring I started volunteering at a large botanical garden a few years back. Strained my ankle walking on the uneven grounds. Bought a support to recover and have been using it regularly ever since. Now I wear them on both ankles as a preventative. No more injuries! These supports give me confidence and comfort. Just finished a 42-day Holiday event averaging 5 miles walking per day, every day; and my feet and ankles feel great! Pros: Durable. Comfortable and secure. Easy on and off. The Donjoy ankle brace provides the type of support that I need for my ankle, but still allows maneuverability. 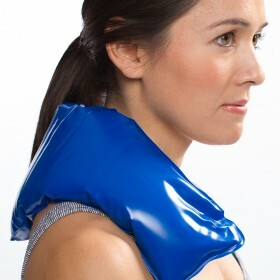 I bought this to provide some relief for ankle discomfort caused by a bad knee, which it does in spades. I've always been the type who gets bothered by little things, even something as dumb as a sock getting slightly twisted around on the foot, and the only reason I ever notice I'm wearing it is because my ankle isn't hurting. Pros: Does a great job at compressing the ankle without being bothersome. Cons: Once I broke it in it became too loose to wear over a bare foot, and given that I'm a size 14 wide, that isn't exactly nothing. I had an ankle reconstructed 3 years ago. I still need support but was disappointed in this brace. It was not substantial enough and I can only use it in combination with another type of support. The brace is constructed well but i wear a 12 shoe and was not able to put the brace on over my foot. Note that our site has a 30 day return policy. We are more than happy taking back this size and having you re-order the correct size. My son sprained his ankle and we were looking for support he could wear while training and competing martial arts, so we bought this brace. It provided no more support than a sock. We were really disappointed, there is no rigidity to it whatsoever. It was a very nice looking product, though. So far liking both of my Trizone supports. I had 1st tried a large and after a few weeks it stretched and it just was not doing what I thought it should be. I spoke with a customer service agent and reordered 2 mediums and they are working great. Pros: They give you a good amount of support. I've noticed that my ankle does feel better wearing them. I have sever arthritis and my ankle doesn't hurt as much. I differently would get at least 2. Hope that you enjoy them. Cons: Is tight to put on. It has colored my skin because of the dye. Depending on the you are looking for You should speak with a customer service agent before ordering, so you won't have to send back and wait another 2 weeks. Or just order 2 different sizes. These are not cheap for being cloth wraps. When you compare them to a aircast brace. Product is great! A nearly chronic ankle pain really reduced during and post workout. Pros: Easy to use. Lightweight. looking for a different support. Found it comfortable to wear, give good support for what I wanted as a substitute for my aircast wrap. Pros: Comfortable, fair support, good for golfing and walking, A good switch between this and the aircast wrap one that I wear most of the time. Also OK to wear to bed. Cons: Little hard to pull on, not much stretch.